This or the next update may be the last for a while owing to serious problems recharging the laptop batteries. I'm writing this on the backup machine, and I don't think the battery will last for more than 2 or 3 updates' worth. Hopefully the problem can be rectified in 2 weeks time when we fly to Bali for our first visa renewal. I'm counting on there being a vaguely competent electonics outfit that has transformers for the blown power adapaters. First off - for family reading this - all is well. Lourdes and Chris are actually traveling together separately from April and I to Labuan Bajo (a week away) in order to give Lourdes and I some breathing space following a disagreement a couple of nights ago. They have charts, an EPIRB, first aid kit etc - basically all the same safety equipment that April and I have, so they will be fine. We have also set up a search and rescue protocol in the event we don't hook up in LB in a week's time at our rendezvous point of the 'Gardena Hotel'. They leave the town of Riung this morning (28th). April and I actually left yesterday afternoon and spent what we thought was going to be a magical evening and night on a tiny coral island (one of 24 surrounding the area of Riung). At just 100x200ft and with an idyllic coral sand beach for pitching tents we thouht we'd really hit the jackpot for camping sites. In the week leading up to arriving in Riung we found ourselves dealing with some pretty unpleasant pests at some of the beaches we camped on. If it wasn't hordes of ants threatening to carry everyone and their gear off into the woods one night or clouds of malaria-bearing mosquitos descending on us another, is was spiny vegetation that we had to clear with our bare hands (which then turned out to be highly flammable due to it's resin - a near disaster with the campfire) or thousands of crabs that would emerge from holes in the beach to pick at our food. But nothing prepared us for last night. I was about to send off our lat/long position to my father as I do every evening by texting via the satphone, when I noticed a huge black and white snake at my feet. Snakes aren't my favourite creature - they rank up there with spiders. Especially this one which turned out to be highly venemous. But it seemed fairly lethargic and didn't seem aggressive. HOWEVER, we are in a very remote part of the world. If one of us was to be bitten, it would probably be several days to the nearest hospital - too far I fear for an antivenom to be accessed in a reasonanble timeframe. Basically we're on our own. A minute later another appeared, and a third, and a fourth, and before we knew it we were surrounded (or so it seemed) by poisonous snakes. A bad Lariam dream come true! Our idyllic island paradise had turned into an island nightmare, from which we had no escape until the daylight hours of the morning. It turns out now that what we were seeing was the same two snakes working in a team. They kept on reappearing from the surrounding brush, gradually coming closer, until we were backed into the sea with our equipment and they started to come, as a pair and quite fast now, directly for us. We'd reached the 'them or us' point, and while not keen on killing animals, we just couldn't risk the alternative. So the two were duly despatched with large stick from the fire. The remainder of the night was a fairly sleepness one. We imagined hundreds of snakes on the island, burrowing under our tent and hiding in our kayak ready for a nice surprise out at sea the next morning. But daylight broke with no more dramas, begging in both of our minds, why these two snakes (from the sea) and what interest did they have with us on this tiny island? Neither of us are superstitious, but there's something quite odd about the whole thing, enough to give both April and goosebumps. We've heard of some forms of blackmagic on these islands being used for revengeful purposes. Did we offend someone in Riung, enough for revenge to be exacted? One more thing that I haven't told April, as I know it will feak her out, but when I looked for the carcasses this morning - where I'd thrown them on the beach above the high water mark - they'd both disappeared. More witchcraft? Or perhaps there's something ELSE on this island bigger than snakes? We've been told to be careful of camping on beaches from now until Komodo Island because of the risk of large monitor lizards (related to the Komodo Dragon). A tourist saw one not far from here on the mainland that was supposedly 3 metres (10ft) long. We're in the fishing village of Riung, resupplying. However the laptop battery is about to die, so this will be v. quick. Major upheavals in the team line imminent I'm afraid - a big falling out between myself and another party that has yet to be concluded. Clarification tomorrow I hope. The update from now on will be just once every two days owing to a some of the recharging equipment getting irreparably damaged when the front of my kayak was swamped a week ago. We're having to recharge the laptop batteries directly from the solar panels now which, being an unregulated power source, doesn't seem to work as efficiently as before. Taking sensitive electronics into the field is always a joyful experience. A typical day for us begins around 4.30am when we get up and make a beeline for the kettle to start water for tea and coffee. As with the bike ride across austral, we're finding that an early-ish start before the heat of the day makes more sense. After an hour and a half of breaking camp and loading kayaks we'll set off around 6/6/30 and paddle for around 3 hours until 10 am when we stop for brekky - either noodles whipped up over a fire or tinned sardines on crackers. By this time we should have nailed around half of our daily quota of 15 miles. After an hour or two we'll continue on until 2 or 3pm when we start to look for a good campsite. At the moment, with the low tide around midday, it's really important to allow enough time to find a good sandy beach without rocks and without breaking waves that would make a dangerous last approach. Sometimes it'll take a hour or more to find one. We're finding kayaking to be pretty arduous, especially with the amount of weight in each boat (extra food, water and electronic equipment). So by the time we hit the beach we're all pretty exhausted. A cup of tea is usually high on the list of priorities followed by collecting firewood, setting up tents, pulling the kayaks far enough up the beach above the high water mark (this can sometimes take a best part of the rest of the day if the tide is low in the afternoons like it is at the moment - each boat has to be emptied of all it's heavy gear before we can carry or push it far enough) - all the usual chores of setting up camp, made different however in this part of the world by the almost guaranteed audience of locals who turn up in droves to goggle at us (there is no word in the Bahasa Indonesian dictionary for 'privacy' by the way). Then it's an evening meal (veggies and rice), writing the blog and time for bed by 8.30pm if we're lucky. I'm usually the one last to turn in, sending off the update via the satphone and making sure our 'third eye' - the infrared security sensors are in place correctly. Tonight looks like a record - 7.45pm. I haven't been to bed this early since I was 8. Using x360 as an education tool remains one of the core objectives of the project. We're fortunate to be supported on this leg by UNESCO Jakarta and the Indonesian Department of Education in arranging visits to schools en route. By chance yesterday evening while preparing to camp on the beach we were befriended by Piter, who as well as lending us his Tilley lamp as added security during the night, also invited April and I this morning to the school where he worked - 'SD Inpres Patisomba'. When we arrived at 8am we were introduced to the English teacher Rina Sadim, who spoke pretty good English and understood the written form even better. After explaining the context in which we were traveling (by kayaks from Dili to Singapore), and a little background information about the larger expedition around the world, we proposed setting up a pen pal communication between her school and a school in the US. Never has there been a more important time we feel to nurturing cross cultural understanding and communication between different countries, especially predominantly muslim countries and western ones like Britain and the US. April had brought 10 letters from a class which Rina proceeded to translate in front of us to make sure she could undertand the English OK. All seemed to going pretty well until we got to the part about the family of the student in the US. 'I have two brothers and three suspenders'. I looked over the April who had also seen the mistake and looked a little alamed. 'What is this word 'suspenders?'' asked Rina. Good question I thought. I know cross cultural linking is supposed to broaden the horizons of participating students, but the idea of an eleven year old boy prancing around in suspenders might be a little too much too soon. 'They hold up trousers' offers April in the nick of time. 'He meant to say 'sisters''. Close shave. From offshore, Maumere began to take shape the closer we approached land. This was to be a restocking point for supplies for the next hop down the coast of Flores. We also hoped for an internet café to touch base, businesses to deal with immigration questions, banks for exchanging money, ect. I’d seen Maumere briefly from the crowded bus window in my initial trek across Flores, but hadn’t recalled it as being any more than a wide spot in the road. It proved to be much different upon our arrival. Coming into a town is always such an adjustment. People in small villages will congregate around us with much curiosity (a group of small children the other evening were absolutely fascinated with my setting up the tent and putting air in the sleeping mats!). These same folks offer eggs and vegetables in exchange for a bit of knowledge about where we’re traveling in the kayaks. Arrival in town, especially with a unique ‘sampan’ (small boat), brings forth a deluge of curious onlookers, bustling about, volunteering help with moving gear from Point A to B. Organized chaos, and, all this before we leave the beach! The streets tend to roll up about 8 p.m., the traffic lessens and the people seem to fade into the evening. A small bar and restaurant across the street from where we’re staying offers a quiet place at the end of the day, a sharp contrast to the streets a few hours earlier. A huge rat inhabits the flooring of this bar and makes his presence known after the sun goes down. He’s a bit moth eaten and has seen better days. His evening routine involves running full tilt along a series of drains in the floor, much like lab rats in a maze. The patrons of this place take no notice, but I sure do! He’s the biggest rat I’ve ever seen and would give most cats a run for their money! We watch for him to appear on his nightly dash around the drains and occasionally glimpse his long tail disappearing around a corner. Even quiet places in this town are constantly on the move! I guess rat races come in all forms. The past couple of days have been better for April who started off on the wrong foot getting dreadfully seasick on her first day kayaking! I think we were all wondering, not least she, whether she was liable to getting queasy just at the mention of salt water (she was seasick for 32 out of the 33-days pedaling with me across the Coral Sea from the Solomons Islands to Australia!). But the last 2-days paddling have been no problem, and like so often in far flung places around the world that the expedition has taken her she's been drawing inquisitive children to her like a magnet. It's been hard paddling the past couple of days. The SE trade winds seem to have established themselves well and truly, and combined with the early afternoon on-shore breezes brought on by the landmass of Flores heating up and drawing air in from the north side of the island, the direction of the wind has been very hard to predict, sometimes coming from the opposite end of the compass to what we were expecting. Yesterday for example we got up early to cross a bay before the wind got really going, but half way across we found ourselves paddling into a 15 knot head-wind. And once we were on the other side and turned westwards again the wind swung around the compass to come at us as a westerly. By the time we reached camp we were all utterly exhausted. Tomorrow we're looking forward to a short break in the town of Maumere to rest up our weary arms and backs before a long haul across the mid-section of north Flores to the town of Reo, a good 10-days paddle. We need to restock with food and water, and find out about flights to Bali from Bima for our visa renewals that'll be due in around 3-weeks. And if we have time some of us might take a bus ride to the town of Moni where the nearby volcano of Kelimutu has three spectular multicoloured lakes to explore. We're pretty remote out here. If something goes seriously wrong, or some vital piece of equipment is damaged beyond repair, it's a LONG way to get help or source materials. This became all the more clear to me yesterday when upon arriving at the beach after the hellish paddle up from Larantuka (that April described in the last update), I found the front compartment of my kayak completely filled with water. On the underside of the bow I found a 4 inch rip where the fibreglass had been opened up like a tin of beans. The damage was done earlier in the day when I'd gone in to an isolated beach to scout it out for a possible landing for the others to rest and more specifically for April to get off and recover from her seasickness. All along the coastline for 12 odd miles it had been impossible to land. After the strong winds of the previous day and the resulting swell over the ensuing 24 hours, the waves along that exposed NE coast were too big and too dangerous to mess with. Rounding the first headland of the day however (Tg. Karangwutun) we'd noticed a short section that looked a possibility. It was rocky, but these kayaks are built for tough work. It's hard to get a clear picture of how waves are breaking on a beach until you're actually 'going in', by which time it's too late to change your mind of course. So I found myself thinking just this, that it was in fact 'a bad idea to try and land on this beach', just as a huge wave picked up my kayak and hurling it forward like a surfboard. The nose took a terrible crunch at speed on the rocky shore. But my priority was then turning the boat around and trying to get back to the others, back through the surf, before the wind got any stronger and the conditions worsened. It's a testament to the design of the boat that I was able to paddle for another 4 hours without noticing anything wrong. The watertight bulkhead separating the waterlogged front compartment from the centre cockpit section held, and I suppose there's so much weight in the kayak anyway (around 750lbs) that an extra 20 odd gallons of seawater didn't make any difference. So yesterday was spent effecting an emergency repair, which Chris did using the last of the epoxy resin and some homemade paint brushes made from the inside fibres of dried coconut shells lying on the beach. We decided to wait until this morning before continuing to allow the glue as long as possible to cure. So we have no more epoxy. Hopefully they'll have something in Maumere where we'll be in 3-days time. But getting back to the original point, although these amazing Current Design kayaks are the very best that the western world has to offer to execute such an ambitious expedition like this, they're somewhat compromised purely by the remoteness of the part of the world we find ourselves in. If we were paddling dugouts, indigenous to this area, we'd have no problems making as many repairs along the way (and finding the local knowledge and hands to do them) as we might need. April's first Day - hardest day yet! The kayak's nose was pointed toward the surf breaking over the sandy beach. I'd taken my place in the front seat of the double kayak with Chris in the second seat ready to steer as soon as we hit the water. This section of beach was to be a bit tricky in hitting the slack water between breakers. The local men who'd come to watch, enthusiasically jumped into the task of launching us first, with Lourdes and Jason to follow. With Indonesian shouts of commands (or were they yelling "Holy Cow! This kayak weights a TON!") and a mighty shove, we were cast off, breaking headlong into the first wave, followed by a series that blasted us in their frothy passing. Lourdes was close on our heels and, caught in the same wave pattern, hit the frothy tops of the incoming breakers. The locals were quite excited by this, yelling encouragement from the shore as the three kayaks were sent on their way. 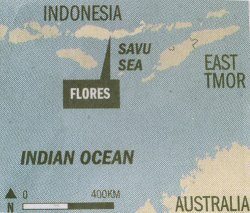 Our goal was to clear the selat between Flores and Adonara. We'd planned to stop late morning for breakfast after we'd cleared the water that was a bit rambunctious. Making our way toward deeper water in the selat where the waves were large rollers, but not breaking, we progressed north. As the morning wore on, our prospects for a landing became slimmer as we observed large breakers continuing to pound the coastline. At one point, Jason made an attempt at a landing, but his kayak smacked the rocky shore upon entry and he waved us off. In a hearbeat, the breakers seemed to double in size, complicating his attempts to relaunch. By now, I was beginning to tire a bit as this was my first day in a kayak. (My only previous experience had been a three hour course on Pueblo Reservoir. "Jay," I told my instructor, "I can't swim real well, so turn me upside down in this kayak and teach me what to do!") I was also feeling quite queasy as we'd been riding big rollers all day, bringing to mind my sea sick crossing of the Coral Sea in Moksha. But, I hadn't anticipated it being a problem in kayaks. I promptly threw up over the side with Jason's "Oh, no!" ringing in my ears. I'm sure he was thinking of the Coral Sea as well. And, due to conditions on shore, the decision was made to continue four kilometers to the headland which marked the north end of Flores. That would put us in calmer water. "Cowboy up, April," I told myself. "Your being here can't be like having two men gone!" We got blown out today - literally. After the usual ordeal of getting going again after a few days off - stashing a new intake of food and water for the next 10-days so it all fits in the three boats - we took off around 10am northbound up the coast with the hope of rounding the northeast tip of Flores before the end of the day. We'd gone just 4 miles however before the wind whipped up to force 4-5 forcing us to make landfall and wait it out. By 5pm we were still waiting, so we decided to camp and make an early start tomorrow morning to beat the wind. If we can get up to the NE tip at least it'll then be in our favour going westwards. I thought you might be interested to know how we're sending these reports back. I'm using a Dell PC laptop to write this update, which is then transmitted via satellite phone to our server in LA. Images are captured from one of the video camcorders and transferred to the computer via a PC card, then crunched down to an smaller size (12kb) using Macromedia Fireworks. I really like this program as it allows one to preview the quality of an image at a particular size before it is exported - crucial when dealing with such a slow speed on the satphone (2400 baud). It's a little more complicated than this however. At least one of the Iridium satellites (now 68 I believe?) orbitting the earth needs to be able to 'see' our phone for a stable data connection. When one is camped beside a volcano this can get troublesome. Then there's the power needed to run both the video camcorders, the laptop and the satphone - this all comes from solar panels. We have one permanently attached to the double kayak so batteries are being charged even when we're paddling (which is always during daylight hours). Then there's the third-party software 'w.bloggar:4.00' (fabulous - thanks to the bloggar crew!) needed to post this update directly into the correct folder of our Moveable Type interface on our server. This allows the update to instantly become 'public' for you to read via the website - no middle person is needed to post the update like in the old days. So, in all quite complicated, but when it all works, as it seems to be at the moment (touching wood), it's certainly the cheapest and most efficient way we've found to update the site so far. Yesterday we bid farewell to our good friend Jansen who jumped in at the 11th hour to help us out paddling the double from his home town of Kalabahi to Larantuka. It was a bit of a rushed last minute affair. After being told numerous ferry schedules back to Alor by numerous people, including the local agent for Pelni (who of all people should know, right?) we got word of the 'Awa' arriving in a 4am yesterday morning and we had just 10 minutes to get him packed and down to the wharf to catch the only way out of here for the next 2-weeks. He left the same way as he started, with just a few minutes to pack and say goodbye. So we'd all like to extend our thanks to Jansen and his family for helping us out. We'll miss his guitar playing and quiet demeanour. When ever us tourist were bickering and arguing about this and that, he would always patiently wait out our domestics in the wings until we'd finished, then rejoin the group as if nothing had happened. Thank you Jansen for being such a long-suffering salt. Tomorrow we head north and around the NE tip of Flores for Maumere. We ended up being here a day longer because of extra repairs needed to be finished on the underside of the boats that are getting serious abuse from being dragged up all the coral sand beaches fully laden with gear. These boats are designed to take a beating, but I think we're really driving them to extreme given the weight we're carrying and the beaches we've encountered, many rocky with little sand to be had. Another reason for an extra day here has been due to one of the video cameras needing repair. It's a brand new Sony PD170 and top of the range for small broadcast quality cameras. However it has been rendered completely useless by a tiny 2mm x 2mm spider that has somehow crawled into the lens apparatus and spun a web in between two of the lenses - completely inaccessible to anyone else of course, including ham-fisted lay lens-technicians (i.e. myself) armed with a leatherman penknife as a high precision electronics tool. Kenny has been on the phone to Sony Pro Repair that have been in turn faxing him schematics of how to take the thing apart that he has then been relaying onto me in verbal form via the satphone. Needless to say we haven't got very far. If it wasn't such a hilarious situation I'd be seething. Dark blue water dotted with islands ringed by breaking surf slipped under the wing of the twin engine puddle jumper I was aboard, heading for Labuanbajo, Flores. The plan had been to fly to the east end of Flores to Larantuka to meet up with Jason, Chris and Lourdes, but, as always, the best laid plans. When I'd arrived in Bali, July 3, the only flight available to Flores landed on the farthest western point of the island, the jumping off place for Komodo Island. So, I was looking at a bus ride across the island, taking about 12 hours, I'd been informed. When the plane landed, I was hustled into town by a local taxi, sold a bus ticket for $3, US, (I'd kindly refused their offer to drive me to Larantuka by taxi for $200, US), then spirited out of town toward the local bus terminal, 7km from the town center. But, as we passed the bus I was to ride, parked on the main street through Labuanbajo, I began to grow a bit suspicous the farther into the country we drove. This scenario was complicated by the fact that no one was speaking much English except me. The bus terminal eventually materialized, I reached for my rucksack, stepped out of the taxi, turned to grab the bag full of expedition gear and noticed with a bit of confusion, the taxi was half way to the main road with my gear still aboard! Not wanting to create an international disturbance, I began questioning the driver in a semi-loud voice if it might not be a thought to unload my last bag before leaving? In the meantime, the driver's partner and three other lads chased the taxi to the main road, retrieved my bag and hiked back to get me on the bus which had recently arrived at the terminal. Five hours later I found myself in Ruteng for the night. The next couple of days found me on various buses, winding my way across Flores, to Ende in the south, Maumere in the north, and finally landing me in Larantuka, two and half days later. I've traversed the most spectacular island of volcanic mountain ranges, with deep valleys, which people have terraced to grow and harvest rice. Acres of banana trees, palm coconuts, small villages of thatched roof houses overlooking the coastline have given me a glimpse into this most fascinating region. Language has not been a barrier of these most helpful people as I arrived in Larantuka last evening and began searching for Jason and the crew. "Two men, English," I kept repeating to the bemo driver who smiled and held up two fingers. We made one pass down the crowded main street, then back, searching for familiar faces. The driver suddenly turned into a hotel parking lot to turn around. There stood Chris and behind him, Jason. Excitedly, I shouted, "Well done! There they are!!!" The driver looked a bit confused, then realized we'd been successful by my reactions. Rather amazing to me to locate them when I'd been out of contact for two days and no one knew exactly when I would arrive. What an adventure of the past three days and the adventure for me really hasn't even started! We had to wait for 5 hours yesterday morning to make a 10 minute crossing from Adonara island to Larantuka where we are now. Being such a narrow passage for the water to flow during tidal swings things can get quite intense - the tide running at up to 8 knots. But patience is a something we're getting a lot of practise at! The same body of water that would have overturned our kayaks just an hour before turned out to be near flat calm by the time we crossed at 1pm. One of the concerns when arriving in a town is finding a hotel close enough to the beach that we can carry the kayaks and the gear without it being a major hassle. The Rough Guide book for Indonesia had recommended the Hotel Rulies, a Dutch era wooden building with 'bags of atmosphere and friendly staff'. We made a rough guess as to where it might be in relation to the ferry pier, and magically the very spot on the beach we landed ended up being directly opposite the hotel. Add to this the fact that they had just 3 rooms left for the night AND they had cold beers inside AND the place is indeed friendly and charming - well, clearly it was meant to be! Within 10 minutes we had all the boats plus the gear inside the hotel - costing just 15,000 rupiah ($2) for some local lads to help us out. It's great to be traveling through a sea-faring nation where there are always a dozen or more pairs of hands on any given beach to help haul dugout fishing canoes, or in this case plastic kayaks, 2out of the water and up onto the beach. I have to admit the hike to the volcanoes yesterday was the toughest one i've done in months. Starting early in the morning from sea level we painfully made our way up to 4754 ft. On our way up Slyvester(our guide) took us to where his friend was working in the jungle and gave us fresh betel nut (energing stuff) straight from the tree and fresh coconut milk which they climbed a tree to get for us. It made a world of difference in my system and my stamina kicked in a few notches and off we went to continue the grueling climb. The path was fine until it turned into thick brush and sylvester had to machete the way for quite awhile until we got above tree line. Continuing up & up we finally reached the ridge that overlooked this spectacular volcano. Supposedly it hasn't erupted in 300 years - who knows? Anyways, there was this continuous smoke coming out of the cone creating these interesting formations. The ashes that rested in the crevices was this beautiful lemon yellow color with light grey hints to it. Also, an abundance of white ash as well which from a distance made me think of snow. The volcano was surround by a beautiful chocolate covered crater that was covered in areas with the white ash. We stayed up there quite awhile enjoying the scenery of sandy beaches in the distance and neighboring islands sprinkled about. It was quite soothing and peaceful and I could of stayed up there for hours BUT we had to get back. Heading down was miserable because the terrain was extremely loose with small rocks everywhere. I kept sliding down every few feet and my poorly made TEVAS (only 5 months old) kept falling apart on me. The path got worse which was completely covered with dried leaves and rocks. I should of been wearing skiis cuz all I did for 3 hours was slide and slide and slide and fall and fall and trip all the way down to the road near the village. i couldn't even walk when we got down but, i mustered some energy to walk to the local kiosk to buy some cold beers which turned out to be warm. But, who cares because when we got back to camp I cracked one those babies open, sat in front of the fire and reflected on how much fun I'd had. The photo below shows the quietly smoldering lli Wariran volcano (don't ask me how it's pronounced) - our first 'live' one. I elected to stay behind today on our first day off since leaving Kalabahi 5-days ago and look after the gear on the beach here at Wai Matan village while the others took a hike up the 4754ft peak to have a look-see. Had my first success with the spear-gun today. I wish I could say it involved some skill, but the truth is a school of fish swam past and I fired at random, skewering two in one shot. My efforts otherwise have been disastrous. I have perfected the art of chasing all the fish off any given reef in eastern Indonesia and exhausting myself in the process. There must be a knack to this spear-fishing business. Tomorrow we leave for Larantuka - ETA Tuesday late afternoon. Our passage across the northern coast of Lembata today was dominated by the Kedang volcano towering to our left side. At 5027 feet it commands not only the view but also the local weather conditions; heavy rain clouds build up on it's south side driven by the now ever more constant south east trade winds, the only respite from which we found in the lee of the volano for the mid part of the day. So the terrain is starting to change, and the people with it. The people of Lembata seem a little more outgoing and playful than the people of Alor, bordering on fiesty even. Chris and Jansen were challenged to a pretend race by four fishermen in their 'sampans' (dugout canoes). They whooped and hollered encouragement to each other (and probably insults to us) as they churned the water with their paddles and even their bare arms. Some of Lembata's most famous inhabitants reside on the south coast in the town of Lamalera. Traditional whale hunting is still practised here, at least still by the middle aged men (the younger generations consider it old-fashioned, so the practise probably won't last much longer). This is the only place in Indonesia where whales are still hunted 'the old way'. Instead of motor boats and explosive harpoons, 12 metre 'prahus' are paddled, with the harpooner balancing precariously on a flimsy platform at the front of the boat. When he gets within striking distance he hurls the lance, leaping in after it irrespective of which creature he has speared, hoping to put his full weight behind the spear and pull of a quick a kill as possible. Then the fun really begins. The whale will typically take off, reeling off a couple bundles of rope (woven from palm fronds) before towing the boat off behind - sometimes as far as Timor! Regardless of ones views on hunting these magnificent beasts you have to admire the whale hunters of Lamalera for their vim and vigour.